In my opinion, Rowan Coleman is one of the best modern fiction writers around today. She first came to prominence in 2002 with her first book ‘Growing Up Twice’ which I thought was an excellent first novel. I have been a big fan ever since and have thoroughly enjoyed all her subsequent novels. ‘The Baby Group‘ ,like all the others, is written with great insight and perception that shows that she clearly understands what it is to be a woman in the 21st century! 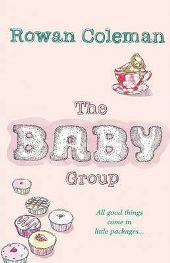 ‘The Baby Group‘, as you might guess from the title is about a group of mums (and one dad!) who all meet and form a bond through looking after their young babies. For most people who have had babies the unique group that you form with other expectant parents, either through the NCT or local surgeries, is often a lifeline and a mutual support group like no other. I know my own experience of belonging to an ante-natal group (which later became post-natal) was very important to me, and one of the reasons why I was so looking forward to reading this book. There are six parents in the baby group. Although their backgrounds and lifestyles are vastly different they can also identify with each other through their babies. When they first meet up it is with the purpose of attending activities together like baby gym, singing and swimming. As time goes on though, they learn more and more about each other and are able to support each other through real crises! The main character in the book is Natalie, who up until the point of giving birth to Freddie was a dedicated career and single woman. It was during a whirlwind romance that her son was conceived, but as the father never got in touch again she is faced with the prospect of single motherhood – which she takes in her stride, but can’t quite admit this to the rest of the group so she invents a pretend husband working in Dubai! The other members of the group include Jess, who is understandably very nervous over the health of her son after having lost babies in the past. Then there is Meg who with four children is definitely the most experienced and her rather annoying sister-in law Frances who cannot bear mess and lack of order (quite difficult when you have a new born baby!) Steve is a house husband while his wife works, and the youngest of the group is sixteen year old Tiffany who is desperately trying to get her parents to accept her relationship and her baby. So you can see, as often is the case in real life, that it is a very diverse set of people who have come together to form the baby group. As the novel unfolds there are very funny moments as the group take on some of the baby activities, but also some very poignant ones too such as a straying husband and a sick baby. Throughout the book, Natalie is also struggling about what to do about Freddie’s father. Does she want to seek him out for the sake of Freddie or is it still too painful to think about meeting the man who let her down so badly? This was the sort of book that I just wanted to keep on reading. I could identify with a lot of the storylines especially with not so long ago having been a new mum myself. I felt that all the characters were really thoughtfully developed and I could identify with all of them to varying degrees. I always think that a novel is successful if you start to care about the characters – I certainly did with these characters so to my mind it is very successful. Rowan Coleman seems to be very adept at writing about relationships and there were a lot of different ones in this story. There were the mothers’ relationships with their babies, but also with their own partners and parents. Best of all though was the way the relationships developed within the group as they moved from virtual strangers to true friends! There are times in this book when you will want to laugh out loud, and there will be other times when you will be close to tears. There are just over 400 pages and never a dull page at all. So my recommendation would be to go out and get this book if you want a really good read, especially if you are expecting a baby or are part of a group now! No Comments on "The Baby Group"